The Super Bowl is the quintessential American pastime. No other event captures the essence of American culture so perfectly: our love of sport, our admiration of spectacle, and our devotion to capitalism. How else do you explain why the Super Bowl advertisements have become as famous as the game itself? I’ve been watching the game for as far back as I remember, including the year I wore a replica Miami Dolphins uniform (including helmet and knee pads) to watch the Dolphins vanquish the Washington Redskins in Super Bowl VII. And I have enjoyed the advertisements closely over the years. 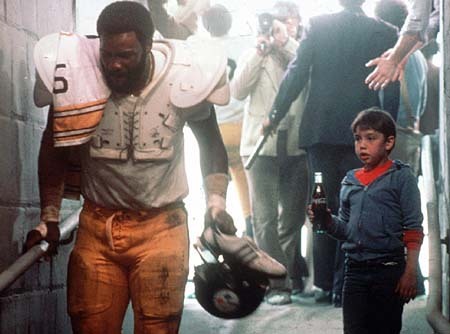 Even though the ads have become increasingly slick and high-concept, my favorite remains one that graced our TV screens 33 years ago during Super Bowl XIV: the Coca-Cola “Hey Kid, Catch” spot featuring Pittsburgh Steeler “Mean” Joe Greene and a little boy who adores him. In 2011, Advertising Age readers voted “Hey Kid, Catch!” as their favorite all-time Super Bowl ad. I believe the ad’s enduring power is a testament to the power of storytelling and the appeal of Greene’s personal brand. The ad, created by McCann-Erickson, endures because partly it contains a tightly constructed story arc, written by Penny Hawkey: after a hard fought football game, the hulking Defensive Tackle Joe Greene limps into a stadium tunnel to lick his wounds in the locker room. He is tired and bloodied. His Pittsburgh Steelers jersey has been ripped off his shoulder pads. A young boy timidly approaches the football star and offers him a bottle of Coca-Cola to soften the blow of what has obviously been a hard day. “You want my Coke?” the boy asks. Greene, obviously in pain, shakes his head no. “Really, you can have it,” the boy insists. Then comes one of the greatest payoff scenes in advertising: Mean Joe Greene, refreshed by a long swig from the Coke, turns toward the boy and gently calls out, “Hey Kid.” The boy turns around, his face revealing that universal look of hope of any child who worships a sports hero. Greene does something wholly unexpected: He smiles — and a genuinely warm smile at that. Then he returns the boy’s gesture by and tossing him his jersey. As I watch the ad on YouTube on the eve of Super Bowl XLVII, it’s obvious that production values have come a long way since 1980. The Coke jingle sounds a cheesy as an Up with People halftime show. But you can’t improve upon the performance of Mean Joe Greene. 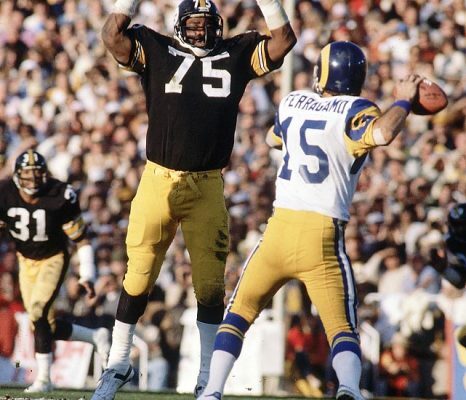 By 1980, Mean Joe Greene had earned a reputation as being a destructive force on the football field. He stood 6’4″ and weighed 275 pounds — and even by today’s standards his height and range would intimidate any quarterback. He was one of the least likely sports stars to savor a Coca-Cola and show kindness to a child. He was close to retirement when the ad ran; the look of pain and weariness on his face at the outset of the ad was probably a reflection of how he was feeling at that point in his 11-year career. Few other stars would have worked for the role. Someone like Chicago Bears Running Back Walter Payton would have been the wrong choice; Payton had a reputation as being a nice guy that his showing kindness to a child would have been anti-climactic. 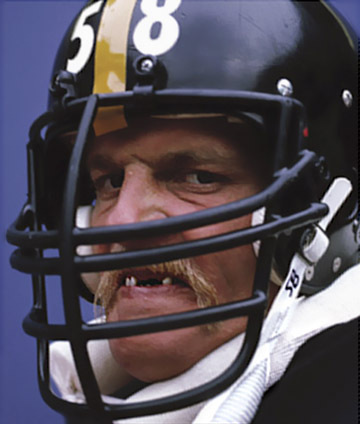 On the other hand, Greene’s teammate Jack Lambert, as much of a tough guy as Greene ever was, carried himself with such a fearsome demeanor that the notion of a child even approaching him to offer a Coke would have been too unbelievable. His face — so often disguised by the football helmet he’d worn on the field for years — even hinted an a warmth and approachability that made viewers accept the possibility that a boy could screw up the courage to offer him a bottle of Coke. By showing humanity in the opening frame, Greene credibly made a mood shift from tired, to dismissive, to grateful. Since 1980, “Hey Kid, Catch” has taken on a life of its own in pop culture. Several TV shows have paid homage to the ad, including parodies on The Simpsons and Futurama. NBC turned the commercial into a made-for-TV movie, The Steeler and the Pittsburgh Kid, starring Greene himself. The ad was remade (with a humorous twist) for Coke Zero in 2009 (featuring Steeler Troy Polamalu). The ad did not debut at the Super Bowl. Coca-Cola debuted “Hey Kid, Catch” on October 1, 1979, and had aired the ad several times by the time it was used on January 20, 1980, for Super Bowl XIV — no doubt to capitalize on the fact that Greene was playing in the real-life Super Bowl that day. According to Greene, the ad transformed his public perception. As he told Coca-Cola, in a video interview “After the commercial, [people] would all come up and [ask] ‘Want my Coke?’ Want my Coke’?” He pointed out that filming him without his helmet was crucial — for the first time, the world got to know the person inside the anonymous uniform. Indeed, the ad would help him transition to a career as an actor and sports analyst after his retirement. Reportedly, Coca-Cola was disappointed that the ad did not improve Coke sales. But of course the ad would create decades of visibility for Coke and a branding partnership with the Steelers (despite rival Pepsi having a broader branding relationship with the NFL). 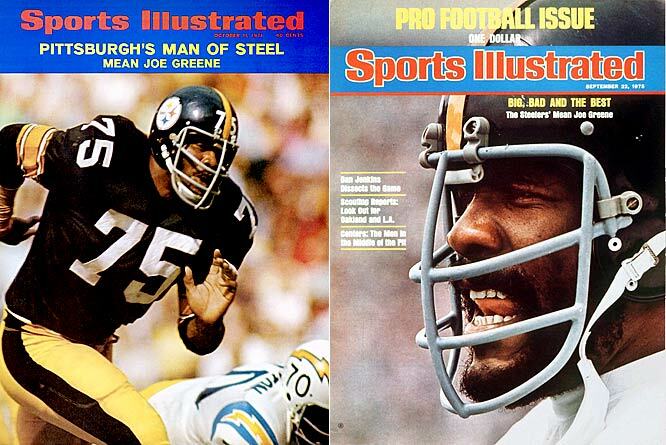 Mean Joe Greene’s personal brand continues to rise in stock, which only helps create a feeling of nostalgia when we view the ad today. No one really knew the real Mean Joe Greene when the ad first appeared (aside from his reputation earned through his on-field play). “Hey Kid, Catch” cast him as a likeable guy. And Greene, now 66, consistently lived up to that image. At a time when major stars such as Tiger Woods and Lance Armstrong have embarrassed their brand sponsors, Greene has done nothing to tarnish a personal brand that was, in effect, launched on January 20, 1980. No one really knew it at the time, but “Hey Kid, Catch” transformed a sports star into a global brand. 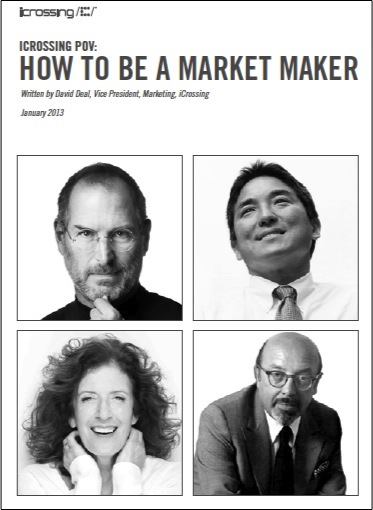 This entry was posted in Marketing and tagged Coca-Cola, Coke, David Deal, Hey Kid Catch, Joe Greene, McCann=Erickson, NFL, Pittsburgh Steelers, Super Bowl, Superhype. Bookmark the permalink.